Gingerbread Art Activities for preschoolers through second grade. Cut large gingerbread boy/girl shapes out of sandpaper. Use double stick tape to attach to a clipboard. Clip a piece of copier paper onto clipboard. Rub over the paper with the side of a paperless brown crayon! Add details if desired. Trace some cookie cutters for cookie shapes. Allow the children to cut them out or cut for them. Use condensed milk to” frost” by mixing with food coloring for different colors. Paint the cookie shapes with the colored condensed milk and it will get a pretty shiny look. Finish with sprinkles and chocolate chips for a realistic look. Gingerbread men are a fun one for this! Have some extra chocolate chips as a treat at snack time! precut or trace and have children cut gingerbread man. Sponge paint brown then glue on candy pieces. How cute! For week of the young child we have cut out gingerbread shapes out. About the size of a piece of construction paper and given to each child in the center to decorate as themselves. they are given what ever they want. when ready we have taped them to dowels and stapled the one to the other as if they were holding hands and displayed outside our daycare center. If we have bad weather them we tape them to the hallway walls with them stapled together as if they were holding hands. Give every child in the class a gingerbread shaped person cut from medium brown construction paper. Use google eyes for “eyes”, paint for “frosting”, glitter for ‘sprinkles.” Etc. I bought a roll of brown Kraft paper (brown paper used for wrapping packages) which was less than $3.00. I rolled it out on the floor and traced each child. I gave the girls a choice of being traced as they were, or having a skirt added to look like the gingerbread girl cookie cutters we had been using. I cut out the tracings. ( Usually I let them cut their own tracings out when we do these life-sized self portraits, but since I wanted them to look like they had been cut with a cookie cutter, I did it myself for a clean line.) The children decorated their “cookies” with art materials. Some did “self-portraits”, other were abstract, and some talked about art materials as representing candy, remembering the gingerbread house we had decorated together. They all looked great on the wall! We also talked about the biggest and smallest cookies, etc. and other ways of sorting and classifying after they were all up on the wall. Cut out a large gingerbread person – we used brown paper bags. Make a mixture of flour, salt and water, (the salt makes it sparkly). The mixture should have a frosting like consistency, but not too thick. Gather as many squeeze bottles as you have children. (Old bottles from perm solution, washed out well of course, work great. And local salons are more that happy to save them for you.) Put some of the flour mixture into the bottles, and, using it like a frosting, let the children decorate their gingerbread man. We gave them gum drops, licorice – the real thin kind, chocolate chips, raisins M&M’s candy kisses and stars. They had a great time and got to eat a few of the treats too. Using brown paper grocery bags, cut out gingerbread people using zigzag scissors. 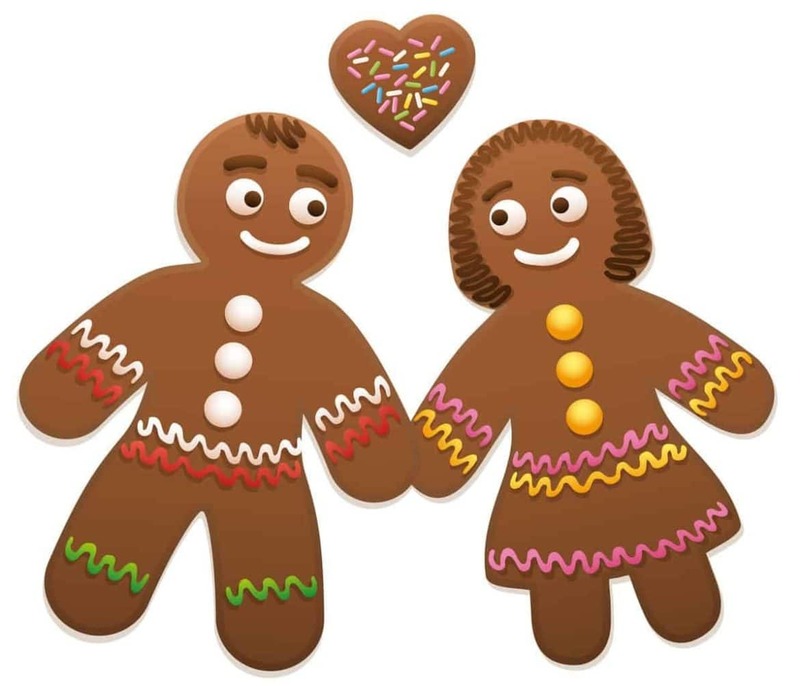 (cut 2 for each gingerbread person) Lay cotton or other material on one cutout and then glue or staple other cutout on top. When dry you have a fat gingerbread person the children can decorate. Use buttons for eyes and nose, and red yard for mouth. Use paint or glitter glue to write child’s name down front of gingerbread person. These make great gifts for parents and look great on a class tree. Applesauce and Cinnamon Gingerbread: My kids and their parents loved these! Mix a large container of cinnamon with enough applesauce to make a dough. Roll out and cut with cookie cutters. (We didn’t roll ours out; I gave each child a hunk of dough and they patted it out, then used the cutters). Don’t forget to make a hole for hanging. Dry the ornaments until dry; ours took more than overnight. Very cute and really spices up your room!! This is very simple, but my class really liked doing it. I gave each child a large tag board gingerbread person shape. They squirted on glue, then sprinkled on cinnamon. Very festive!